A PEN THAT CLEANS YOUR HANDS! 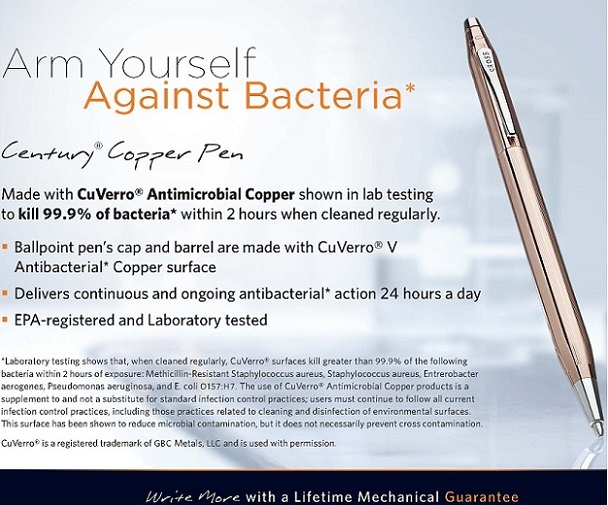 Introducing the Only Pen Made with U.S. EPA Registered and Approved CuVerro® Antimicrobial Copper Surface Arm yourself against bacteria* with the Century® Copper Pen made with CuVerro® V antimicrobial* copper surface - the stunning new copper alloy that is shown in lab testing to kill 99.9% of bacteria* within two hours when cleaned regularly! Main Features Cross has an exclusive distribution right to the CuVerro® V antimicrobial copper within the quality writing instrument category. * Ballpoint pen’s cap and barrel are made with CuVerro® antibacterial copper surface. * Kills more than 99.9% of bacteria* within 2 hours, and continues to kill 99% of bacteria* even after repeated contamination. * Delivers continuous and ongoing antibacterial* action 24 hours a day. * The only EPA-registered and approved Pen. Laboratory tested. * CuVerro® V antibacterial* copper surface is wear-resistant and durable – the antibacterial* properties will remain effective if used as directed. infection control practices, including those practices related to cleaning and disinfection of environmental surfaces. This surface has been shown to reduce microbial contamination, but it does not necessarily prevent cross contamination.